If your house was on fire, your family was safe, but you only had time to save 10 records, which would you choose? 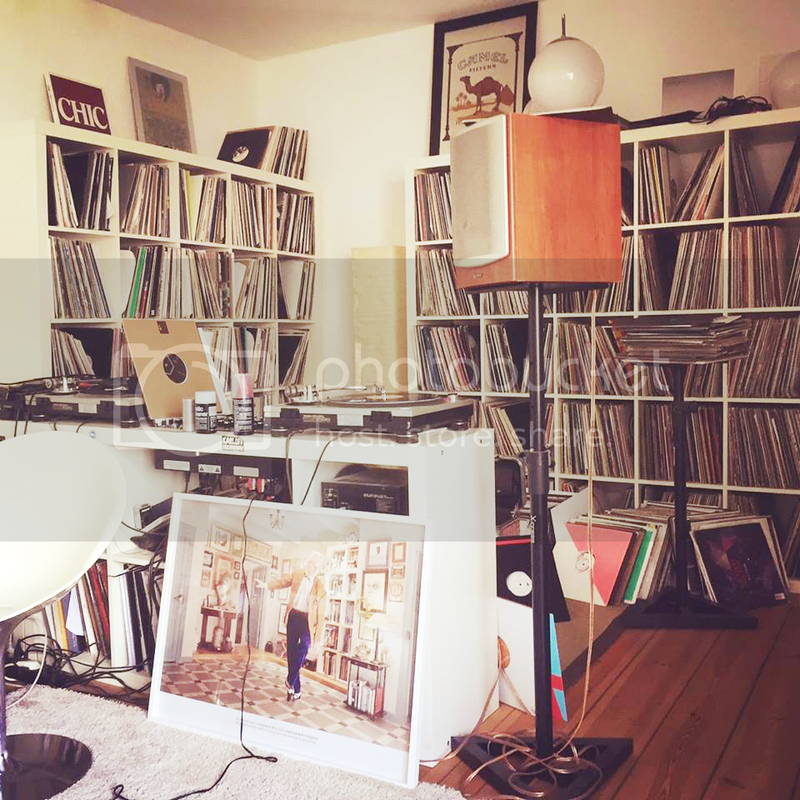 It's the question we're asking for our new The Vinyl I'd Die For series, in which vinyl-loving artists tell us which 10 records they'd risk life and limb for, and give us a peek into their personal collection with a photo. This time Apollonia's Shonky takes the hot seat, a man famous in his own right, and as part of the French trio currently conquering the world with their old-school approach to house. All three of the Apollonia members (Shonky, Dan Ghenacia and Dyed Soundorom) are avid vinyl collectors and players, regularly dropping 20 and 30-year-old gems in their sets at clubs and festivals the world over. It's safe to say the guys know their stuff. Shonky is about to release his first solo effort in four years, following his Minneapolis Touch EP that launched the Apollonia Music in 2012, which will be out on vinyl very soon. The French DJ and producer didn't hold back with his picks, featuring 10 incredible selections spanning the likes of Perlon, Mathew Jonson, Francois K, Surgeon, Losoul and more. Woosh! I had to wait so long to get this one, it’s an old track from 1996 and it was impossible to find it in any store. Around the time I was looking for this record the internet was less important in terms of finding records… I finally managed to find it in London the first time I went to play there actually. This was around 2003. On Discogs. I remember buying this one in New York in 2002. I asked the guy in the shop for some recommendations and he told me, “Listen, this one is going to be a hit”. I fell in love right away and I was lucky enough to come back to France and realise that it was not out yet. It finally went out to the French stores six months later. My favourite record from this amazing producer. On Discogs. It’s a classic and probably my favourite release on Perlon, which is a label that I have been following since I started to buy records all the way back in ‘98. Both sides are killers from absolute masters of electronic music: Zip, Sammy Dee, Baby Ford and Thomas Melchior --- killer combo. On Discogs. Amazing psychedelic deep house track on Francois K’s label. Dan used to play this one a lot at the Batofar after parties. I was crazy about it. Perfect music for the after party — moments I love to play the most. On Discogs. Amazing track from producers I also really, really love: Mood II Swing, legends. This one cost me a lot on Discogs but it’s a must have. This bomb never leaves my record bag. On Discogs. I bought this when it came out in ‘98 and I don’t know how many times I’ve played it since then; It’s also a classic for all of us (Dan, Dyed and myself). We love it so much that we decided to re-release it on Apollonia. On Discogs. My favourite Mr. G remix, it’s from ‘98 and I have seriously overplayed it (though I don’t think I could ever really overplay it!). I bought five copies of this one, no lie. On Discogs. It’s all about the bass on this. What a track, I would have loved to have produced it myself. Big respect; it’s druggy, trippy, classy and utterly timeless. On Discogs. Surgeon, the one and only. All I can say is that this is an amazing techno track, and it’s absolutely perfect for the early mornings. Trust me… I’ve witnessed this one in action in those hazy mornings many times. On Juno. One of my favourite artists forever, I love all the tracks from this guy. But this EP is the one I have been playing the most lately, so I will choose this one. But I could easily have chosen any of his releases. On Discogs. One of the first records I bought in my entire life, I picked it up at Techno Import, a famous record shop in Paris. I was completely amazed by the sound. I didn’t even know where I could play it apart from my bedroom. Since then I have played it so much, at any time I could! On Discogs. It’s a five star LP compilation with so many classic tracks from the master. A must have from a great inspiration, amazing DJ and of course of a godfather for all of this. On Discogs. The Plombiere EP is out vinyl only on Apollonia Music 17th June. Pre-order it here. Apollonia begin their Music On residency on June 10th, and you can catch them at Off Week for Circoloco and Half Baked vs Lola Ed. Pulse Radio launches its new audio production series with Mike Kiraly: Sound/Concept.